Last edited by Aditya : 7th August 2018 at 13:38. Thanks Aditya for the July sales data. Some facts of the Auto industry’s July dispatches. - A small portion of lower sales also to be attributed to the Truck strike in July. 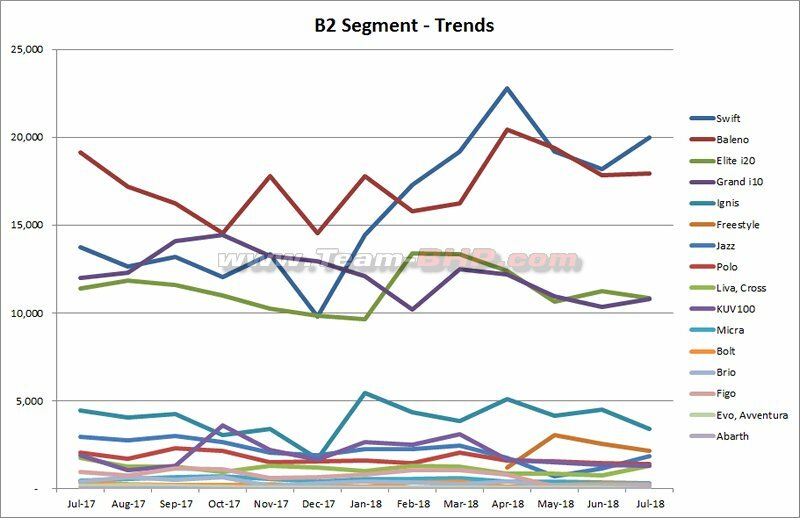 - However, Maruti Suzuki’s market share grew even stronger at 53.3% which was a healthy 1.2% growth over previous July. 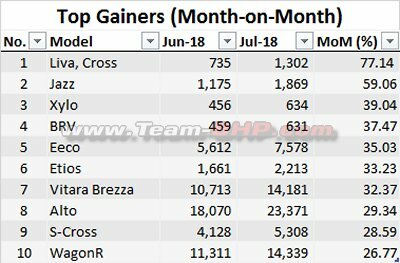 - The highest Market Share growth was registered by Honda Cars with a jump of 1.2% owing to the response for its newly launched Amaze, and taking Honda to the coveted Nr. 3 slot a position regained by Honda after 3 years. - Compact segment expected to gain at the expense of premium hatchbacks. 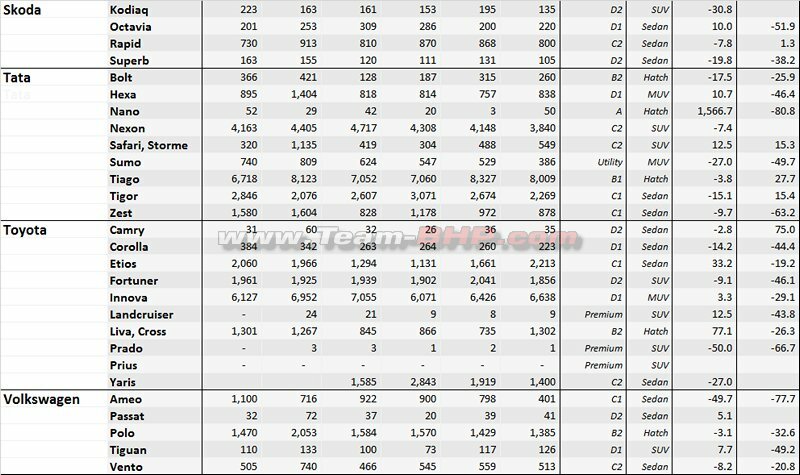 No.1 & No.10 selling car belong to the same segment in July’18 – Compact Sedan! Dzire & Amaze combined sold ~35,800 units. 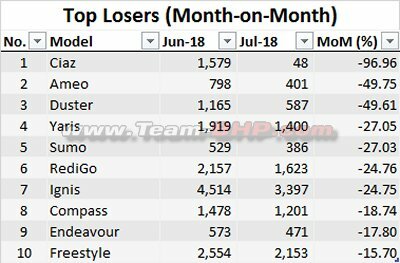 Amaze also contributed to ~51% of Honda’s overall sales in July’18! - Toyota fails to impress buyers with its Yaris and now will be looking to launching cars in JV with Suzuki. Toyota’s Y-o-Y de-growth was at a massive 23%. 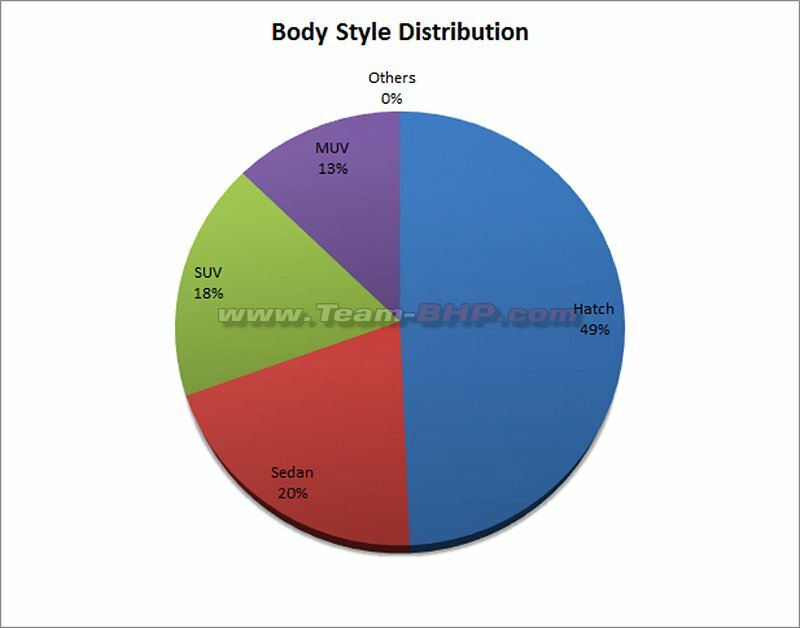 -Entry level hatchback segment shows down-trend, but still commands ~35% of the passenger vehicle volumes. Swift and Tiago are exceptions and show a positive growth. 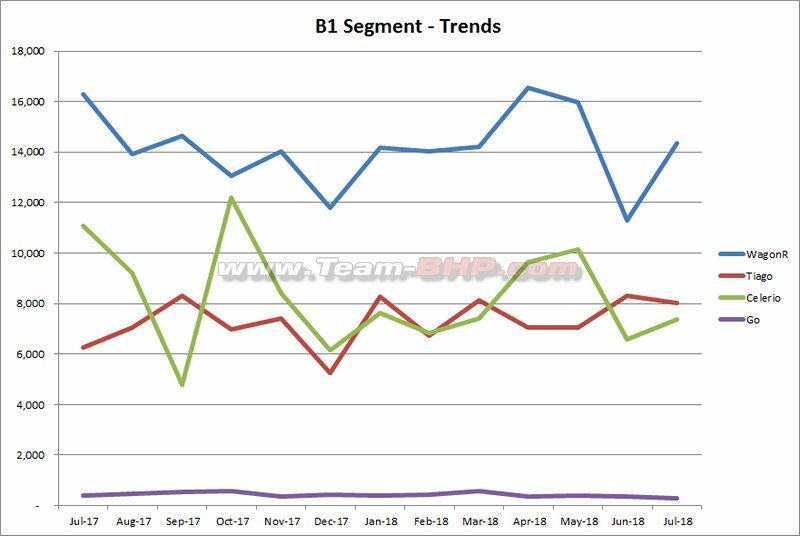 - The story repeats in the MPV segment too with Hexa and BR-V being affected the most. - Compact SUV space is no different with Vitara Brezza leading the pack as Nr. 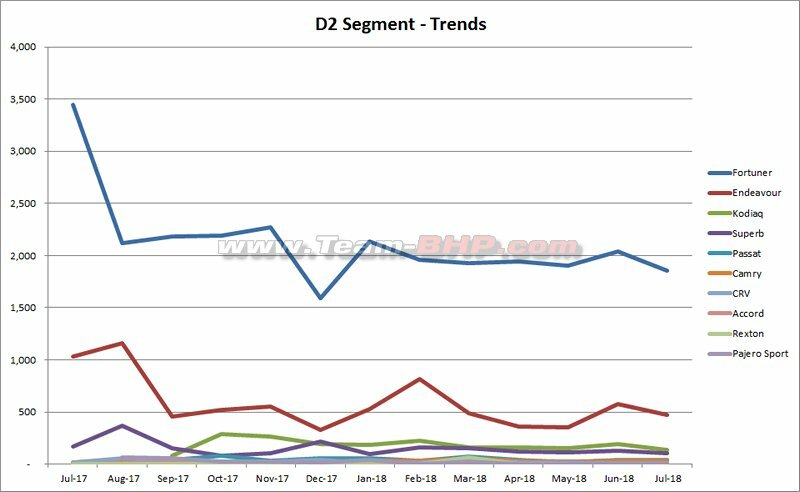 1, the No.2 has gone very competitive and Ford/Tata/Honda are fighting hard for it, with this month going to Ford’s Ecosport. -TUV300 along with its plus iteration hasn’t been doing really well. The sales are limited to Tier-3 & Tier-4 cities. (TUV sold 1457 units & TUV Plus sold 634 units). 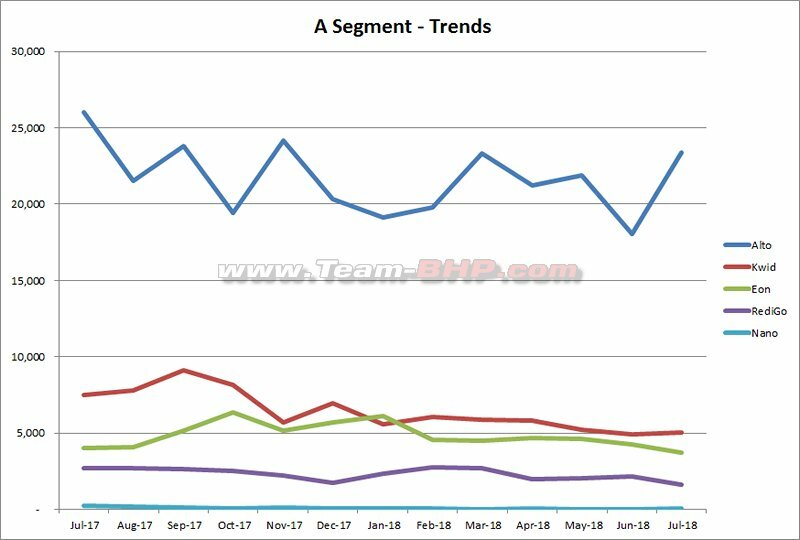 - ‘SUV’ segment is again dominated by Hyundai’s Creta. S Cross face-lift has done wonders and has breached the 5k mark and grows at 83%. -The new iteration of XUV500 has helped the model jump back to ~3k volumes, improves its lead over Jeep compass. - Interestingly Renault’s Duster and its new launch Captur are sharing ~ equal volumes. Renault should plot its strategy and bring in the new Duster ASAP. 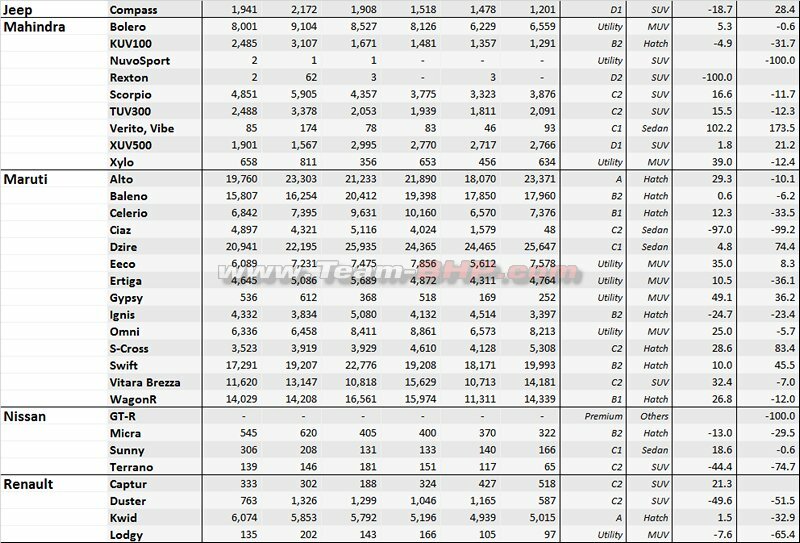 -Pseudo Cross's - Ford has hit the nail in this segment, all other cars are struggling to reach the some respectable numbers. 1. Maruti Suzuki dominates as usual, but this time with 53 percent market share. Dzire is the highest selling Maruti. 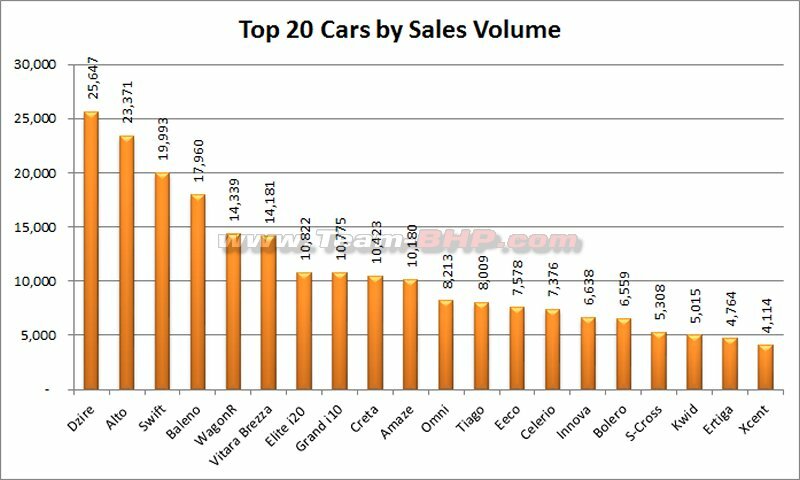 6/10 top selling cars are from Maruti stable. S-Cross face lift has really worked out for Maruti.. 5k + sales. Good days ahead for sure, New Ciaz will bring in more volumes. 2. 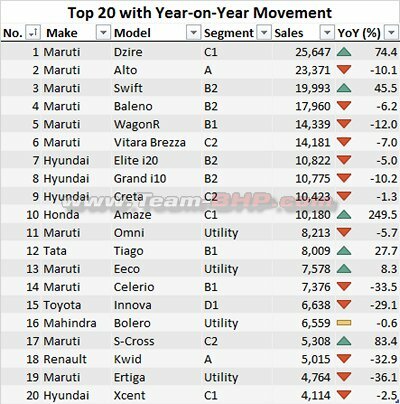 Hyundai is at distant 2nd. Grand I10 + Elite I20 + Creta are the major players. New Verna is doing much better than previous gen.
3. Amazing performance from Honda, thanks to all new Amaze. 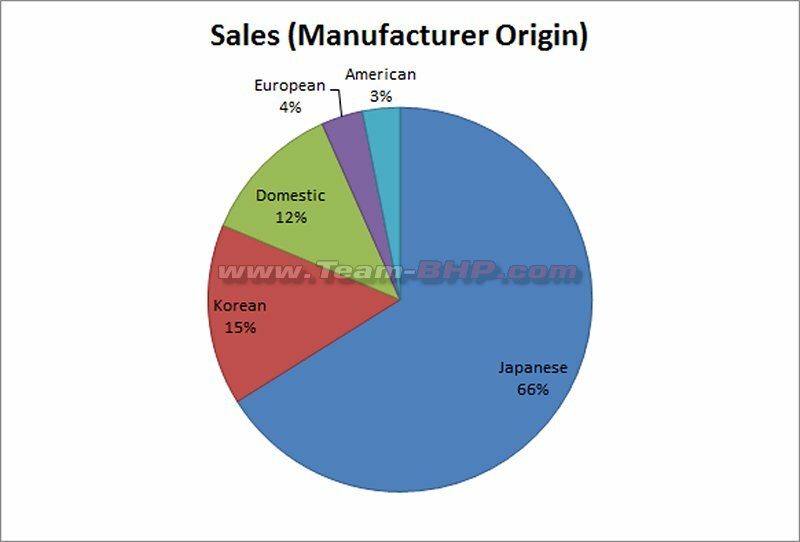 Honda is now at 3rd spot with 7 percent market share. 4. Tata and Mahindra are having close fight for 4th spot. Mahindra wins the game this time, albeit by thin margin. Nano at 50 units, time to say bye bye to Cheapest car of the world. You would be missed! 5. 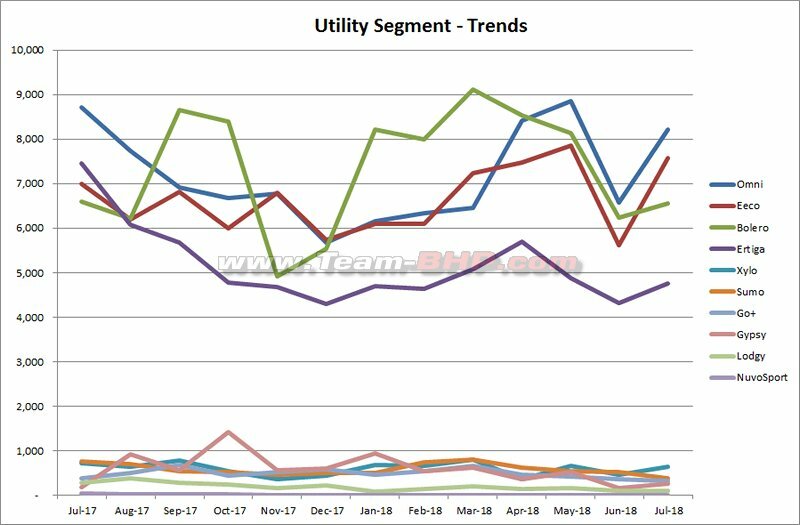 Freestyle is bringing in decent numbers for Ford. Ecosport is still their bread and butter in India. I really hope Figo face lift does better numbers, this car really deserves it. 6. Nothing new to write about VW and Skoda. The performance is below average. 7. Renault - Nissan alliance is struggling. Entry level cars are not India's favourite anymore. Kwid and Redi-Go numbers have fallen. Duster has bitten the dust and Captur is a disaster. 8. Toyota numbers have declined when compared to previous year. The new launch Yaris is doing just average. 9. Only 29 Fiat cars dispatched last month. 2 are Abarth here. Did Fiat completely stop the production? Long Honeymoon period of Compass is over. Jeep is offering attractive discounts / offers now. 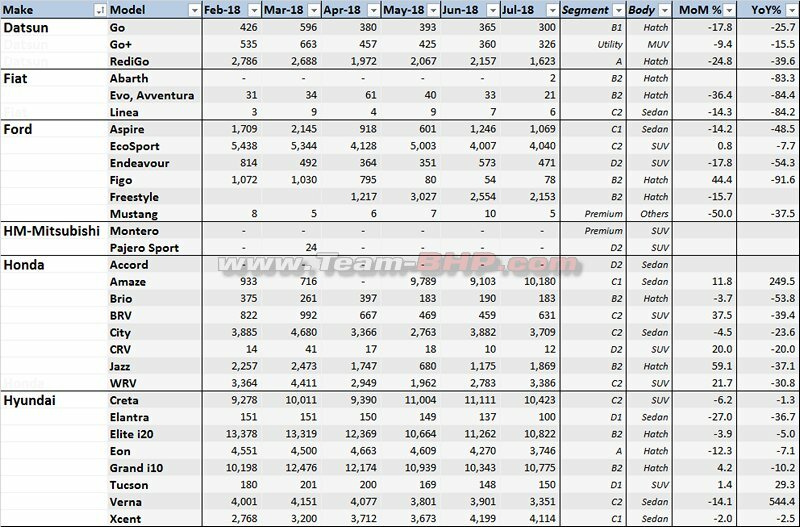 Look at the top 10 selling models and notice how the purchase price has more than doubled over the last decade or so. The slot occupied by vehicles at 3-4L price point like Alto, WagonR is now completely taken over by Dzire, Swift, Baleno...on road prices of 9 odd lakh are new norm. The amazing success story of Maruti is often reported in terms of growth and ability to retain market share, but glosses over the fact that their revenue per vehicle too has gone up manifold. Last edited by avisidhu : 7th August 2018 at 14:22. 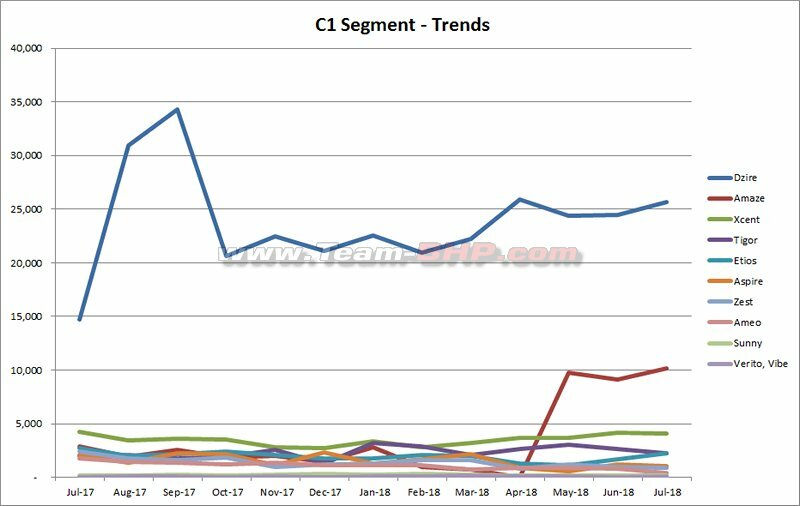 There is no slowing down for Maruti, their market share keeps increasing and this time minus Ciaz they still managed to take 53.35% of the market share. Also, Swift + Dzire @ 45,640 conveniently beats the second placed Hyundai which is @ 43,481. Freestyle is probably the only car in its segment(Cross) doing better than its actual hatch model. 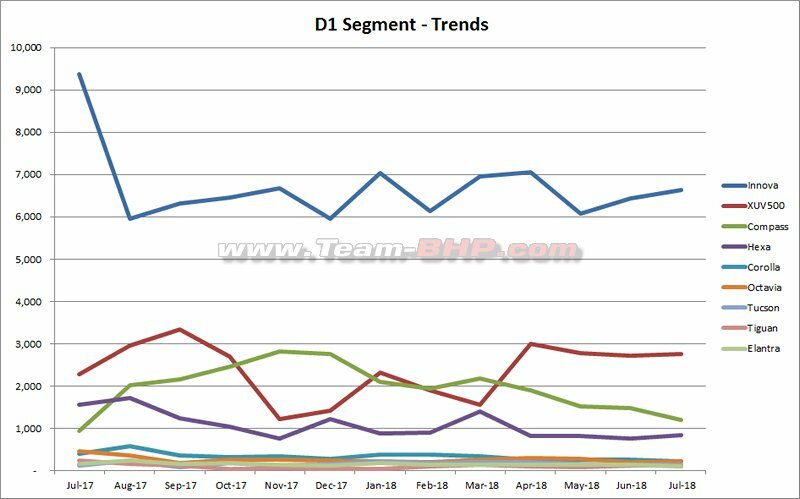 Jeep numbers is on a downward trend, they should bring-in new models to sustain in this market. Else its going to be the same story as Fiat. Look at what a facelift has done to the fortunes of S-cross! It looks like a premium car and if Suzuki badge wasn’t there, it could easily be passed down as from a premium manufacturer. Hope they equip it with an automatic box though. There is daylight difference between the 6th(Brezza- 14181) and 7th spot(Creta - 10822). Hard to believe that the 10k-14k band is always completely dedicated to Brezza/Creta/i20/Grand i10. Ideally, Tiago should also join the list. Fiat - Running on fumes. Should ideally shut shop and concentrate on bringing up the Jeep numbers which is falling. Ford - Ecosport continues to be the mainstay, with freestyle giving them a shot in the arm. If the updated Figo / Aspire can catch a pulse of the market, suddenly Ford shall have 4 models to bank on and reduce the risk of dependency on a single model. HM / Mitsu - how do the dealers make up for the rent? 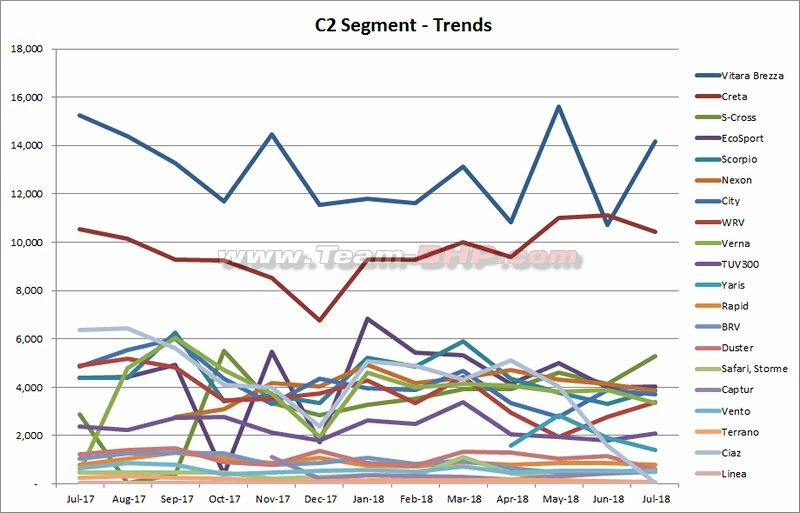 Hyundai - Creta + i20 + i10 going steady month on month, with Verna + Xcent being no pushovers. The runt of the litter eon still sells between 3-4k per month. Banking big on the new Santro to become a hit. Mahindra - Needs to cut off draggers from the portfolio and concentrate on winners (Bolero + KUV + Scorpio + TUV + XUV). Maruti - Midas touch turns almost every model into market leaders. Need to use this consolidated position to introduce niche / experimental prodcuts in the market and not be afraid of failures. Nissan - next GM? Concentrate on Renault & Datsun maybe? Tata - Same as Mahindra - Needs to cut off draggers from the portfolio and concentrate on winners (Hexa + Nexon + Storme + Tiago + Tigor). I still think they should do a Sumo 2.0 with a back to roots, no nonsense sturdy car, this time with creature comforts - look where the Scorpio is now. Toyota - Yaris failed to take a sizeable bite out from Verna + City + Ciaz pie. Innova & Fortuner continue to rake in the moolah. JV with MSIL should do good. VW - same as Skoda - content on playing in the small market share with no intent of going mass market. Would have loved to see how is ISUZU doing. Off late have started to notice quite a few "Lifestyle/Brawny" Pickup Trucks from Isuzu on NCR Roads. ISUZU has been successful in doing away with the utilitarian positioning of Pickups in India (at least in NCR). (NCR) Folks are looking at it as Lifestyle products now. Last edited by payeng : 7th August 2018 at 17:14. [*]Maruti - Need to use this consolidated position to introduce niche / experimental prodcuts in the market and not be afraid of failures. Suzuki better make a note, that name Jimny won't go well in India for a car, closely resembles the popular name of pet dogs in India - Jimmy (no offence to anyone, Jimmy is a nice name). Last edited by for_cars1 : 7th August 2018 at 19:49.